A dual relay Click board, the Relay 3 click features two single-pole, double-throw relays which can be operated by the output pins of the host microcontroller (MCU). It offers an elegant and easy solution for controlling a wide range of power applications. The two SRD-5VDC-SL-C relays used on this Click board™ are hermetically sealed relays which require 5V across their coils while consuming about 0.4W when active. You can use the Relay 3 click in various PLC-based systems, e.g. as a remote ON/OFF switch, or other similar applications. Besides the two relays, the Click board™ contains all the necessary electronic components for driving the relay coils. The two LED indicators provide visual feedback about the activity of the relays. Although it can withstand up to 7A through its contacts, the life expectancy of the relay drops proportionally with the current through the contacts. 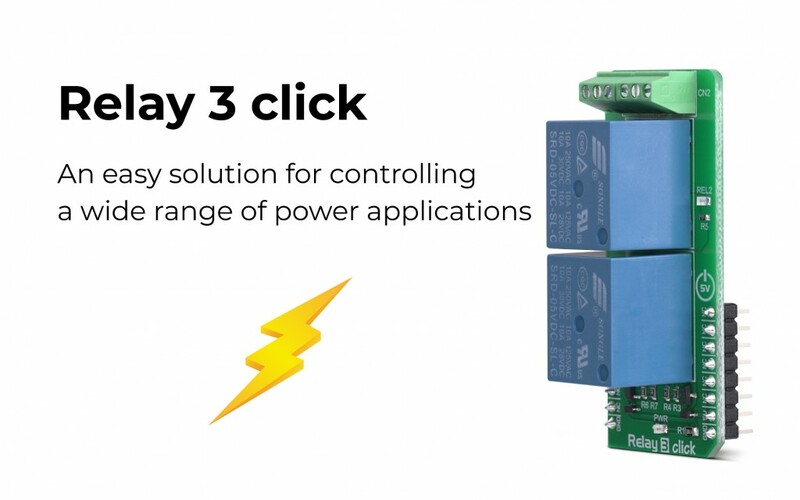 Therefore, Relay 3 click is a good solution for power or signal-switching in the range of low to medium power applications, including domestic appliances, office machines, audio equipment, etc. For more information about the Relay 3 click, please visit our website.